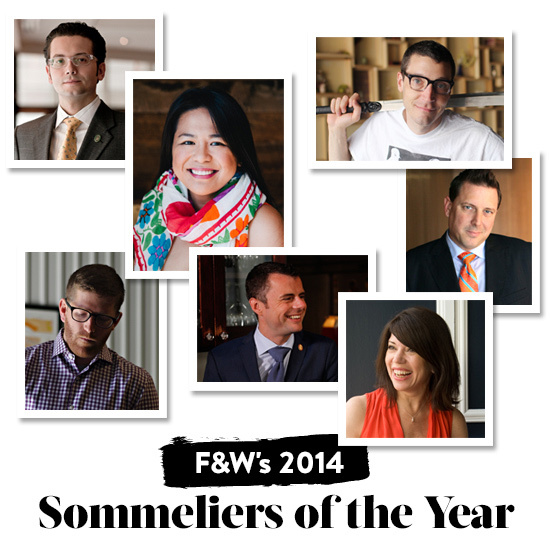 We're thrilled to reveal the 2014 Sommeliers of the Year. Here, a look at why they won. We're thrilled to reveal the 2014 Sommeliers of the Year. To celebrate, all week we're spotlighting their favorite bottles and places to drink, along with a complete wine pairing guide, the best snacks and tips on wine travel. Also up for F&W Wine Week: follow us on Instagram to see the cutest winery pets ever. Why She Won: Rodil has created an amazing list of affordable, esoteric bottles (plus a page of pricey "baller" Bordeaux) and trained everyone on her staff to be a sommelier—from the servers to the cooks who deliver dishes directly to tables. Why He Won: He believes that the wines of Santa Barbara deserve to be served alongside those from the best producers in the world. He's filled his list with old vintages and new producers from the region, including terrific wine he makes there himself. Why He Won: Muser's French-focused list could be intimidating, but he keeps markups low and talks about the wines with contagious, unabashed warmth. Why He Won: This certified master sommelier reminds Americans that Spain is one of Europe's greatest wine-producing countries. The list features both Old World wines from Aragon (an ancient region that encompassed Spain) and New World wines inspired by these bottlings. Why He Won: In just a year, he's amassed 1,500 great wines, all with surprisingly low markups, creating the most budget-friendly place to drink exceptional wine in New York. Why She Won: She's created an extraordinary, mostly Italian list packed with old vintages, obscure grapes and even good Chianti bottled in fiaschi, those straw baskets of the '70s. Why He Won: He's collected fantastic Italian wines to serve at Costata—including dozens of old, rare wines by the glass—while also maintaining equally impressive wine programs for the 12 other restaurants in chef Michael White's Altamarea group.